Now, however, in the post-Snowden and WikiLeaks world, the CIA has a different agenda. There are political careers to protect, and deniability is of the essence. The Agency has mounted a clean-up operation aimed at taking down everyone who worked on the dark side, and Dan himself is a target. But there is also a new ODNI office established to clean up the CIA itself – “charged with tackling some of the more . . . troubling elements that have grown up within the CIA and other agencies in the last few decades.” Behind the scenes, shadowy controlling figures are working to protect their own positions and to conceal the crimes of those closest to them, and Dan, as he embarks on a mission to Sweden, has very little idea who he can trust – and who might, with a single shot, leave him as part of the “visceral wreckage”. Dan is trying to save himself but also to protect other field operatives he’s worked with, “good men” who have “all done bad things”, but who are nevertheless far less morally tainted than the slick corporate figures who pull the strings. As in novels like Who is Conrad Hirst?, Wignall is writing within the traditions of espionage fiction, but his recurrent focus is on the iconic figure of the hitman and on the morality of such a figure – a killer, but one who is carefully distinguished both from the political manipulator and from the torturer (he neither schemes behind the scenes nor involves himself in interrogation). He is also a man who is constantly thoughtful about the personal and moral implications of the position in which he has placed himself. The human isolation of the hitman is one of Wignall’s strongest themes. Dan Hendricks is a man who has inflicted and suffered loss. He has reconciled himself to the absence of children and family ties, separating himself in essential ways from the human community. The hitman’s resolution to protect others by absenting himself is not, however, without huge inner cost, and Wignall establishes a sense of intense conflict between the desire for attachments and the recognition that you can keep loved ones safe only by denying yourself any close connection with them. 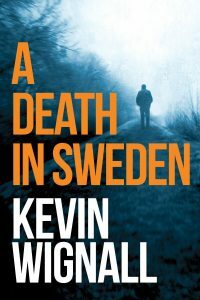 A Death in Sweden immerses its readers in the violence and danger of the hitman’s life. Dan has skills that give him an edge, but so do his opponents, placing him in almost constant peril. Wignall offers us pacy action and some wonderfully cinematic sequences of flight and pursuit. One of the most striking is a solo assault on a well-guarded house in the dark as snow falls rapidly, with his enemies using thermal cameras to guide their fire, anticipating what his next move will be: “He had no choice but to make that move, though—all he could do was play it fast.” The whole of this utterly absorbing novel “plays it fast”. As we follow the vicissitudes of Dan’s hazardous life, Wignall’s vivid scenes and crisp, economical prose keep us in suspense throughout.